What you can do with your kayak is ever expanding and these narrow boats have now taken to the fishing world. Their long and slender design allows them to navigate down narrow rivers with ease. This means that you can take your kayak to even more places. 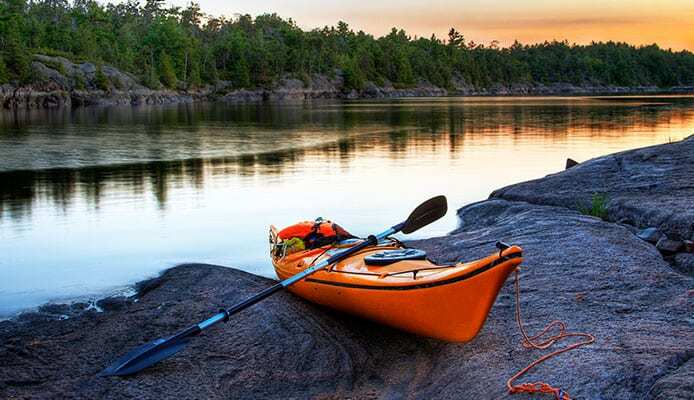 When deciding on a kayak, it is important to know that river kayaking requires a different kind of kayak than you would typically use for calm lake waters. In this case, you would want to opt for a specifically designed kayak for river fishing. The best river fishing kayak is one with a stable base that leaves you with a sturdy ride. Expanding within the sport of kayaking is something we love. That is why we enjoyed it when kayaking spilled into the fly fishing world. 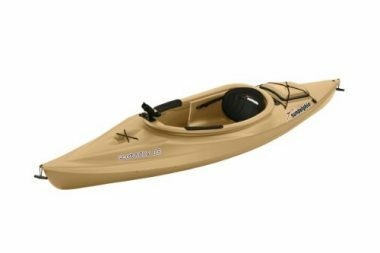 Finding the best fly fishing kayak means one that you can easily cast a line and have room to move around. We have done the research to find the best kayaks for river and fly fishing. Compiling them in a list below, here are the top five kayaks of 2018. This sit on top kayak is lightweight and easy to carry. Adjustable foot braces make this kayak suitable for any size. Using UV stabilized materials ensures this kayak will last many seasons without fading. This kayak gives an incredibly stable ride while tracking through the water with ease. A large spacious cockpit area is equipped with protective thigh pads makes this kayak comfortable, even over long periods of time. A large storage compartment allows you to have even more space allows you to bring all your gear with you. Equipped with a paddle holder that will free your hands to leave you time to fish. This kayak for fly fishing comes with adjustable foot braces to fit any size paddler. 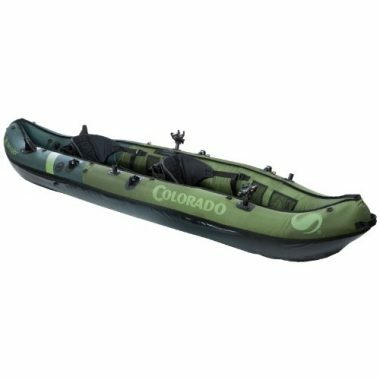 This Sevylor Coleman Colorado 2-Person fishing kayak is great for a fishing trip in any lake. You can transport it deflated to almost anywhere, and then set it up when you get there. There are multiple air chambers, so if you do get a puncture, the boat will remain afloat. We love the rod holders. They are adjustable and will give you a hands-free fishing experience. Much like the other Sun Dolphin option on this list, the Sun Dolphin Aruba 10 kayak is a well made, rugged kayak. 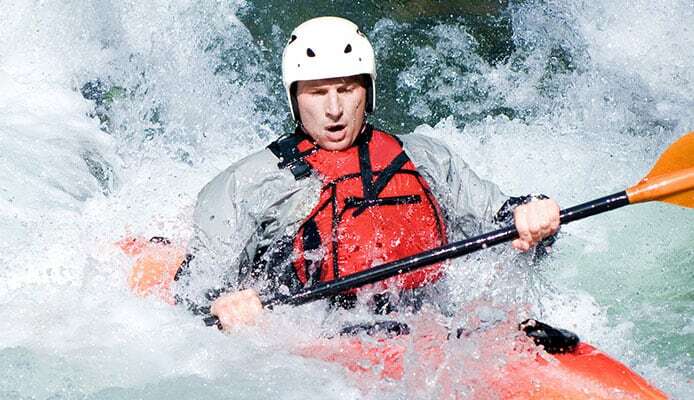 This company has 22 years of experience in making kayaks and it shows with this option. The UV stabilized polyethylene is rugged enough to take a beating and light enough to carry with one person. Much like the Excursion, the Aruba has a dry hatch situate behind the chair which has a bungee system attached to the lid. The seat has ample padding to keep you comfortable and is adjustable to fit any sized person. You will be able to sit comfortably with it’s adjustable foot braces. This stable boat gives a sturdy ride in a kayak that has been specialized for fishing. This kayak has an incredibly high weight capacity fitting an impressive three people aboard. Multiple foot rests give this kayak an incredibly spacious feel allowing it to work for different sized riders. Great for a solo ride or bring this whole family along, this boat is easy to maneuver no matter how many riders. This boat is stable enough to fish standing up or in a variety of different positions. This allows you to have even more comfort when fishing. 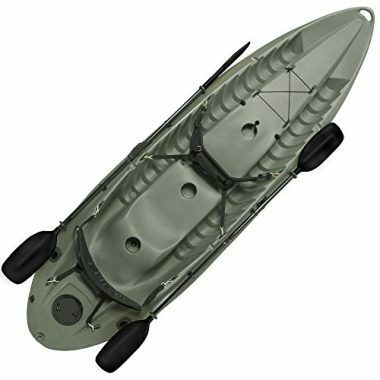 With front and rear handles, you can easily portage this lightweight boat just about anywhere. 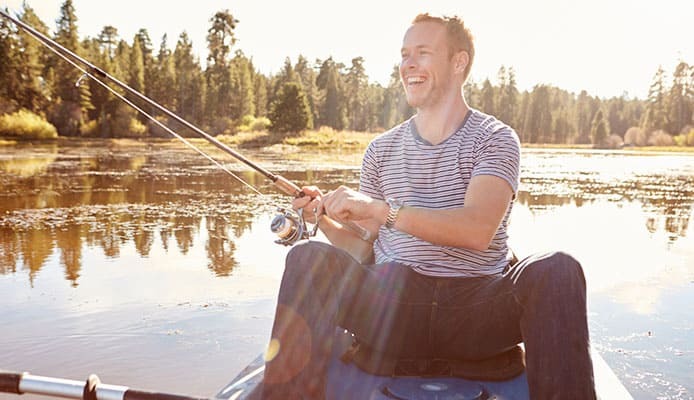 With four fishing rod holders you can free your hands to be able to fish all day. A 6 inch storage hatch combines with a shock cord system giving you tons of storage. This boat is self draining which allows water to get in the boat without having to bail. The Sun Dolphin Excursion fishing kayak is a great one person option. Coming stocked with more rod holders than you’ll know what to do with. A lightweight design allows you to throw this kayak on the roof of your car and comfortable handles make hauling it to the water’s edge painless. The storage solutions have been well thought out and placed with fishing in mind. There is a dry storage hatch directly behind the comfortable chair which has an easy to access bungee system on it as well. This company trusts their design and construction so much that they include a two year warranty in the price. The Sun Dolphin Excursion 10 is a well equipped fishing kayak that will improve your fishing game. 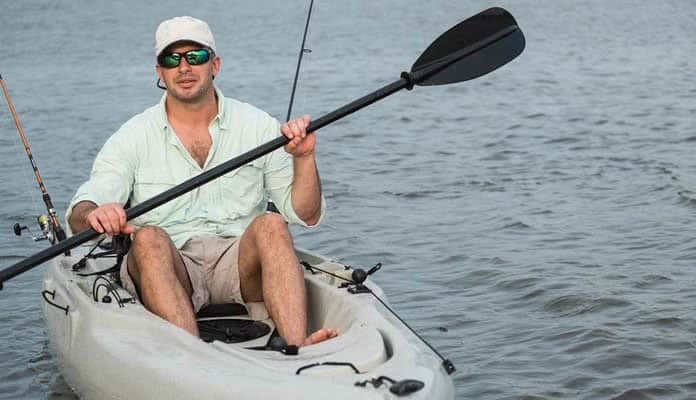 This kayak was designed specifically for fishing. The kayak is fast and stable, allowing you to chase down the fish when you need to. The seat is extremely comfortable; there are two rod holders, a storage hatch, cup holders, paddle holds, a skid plate, and more. This fishing kayak tracks well through the water and can turn quickly when needed. 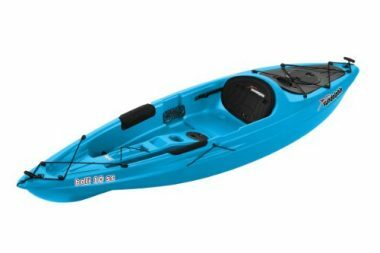 Compared to previous versions of this model, this kayak has a lot more storage capability while remaining the same size. An excellent kayak fishing from, and one which is comfortable. 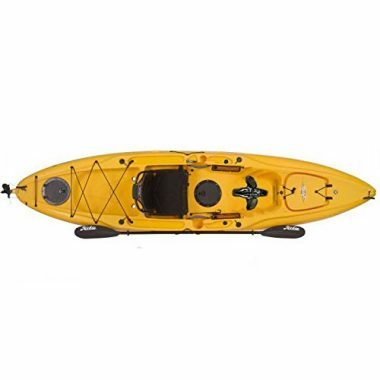 This kayak features a large covered hatch for plenty of dry storage. It also has lots of on top bungee storage to stow any gear you need within reach making sure you can bring all your desired gear along with you. Two 8” sealed hatches allow you to take important and expensive gear with you, such as cameras and phones, with the confidence that they will stay dry. With a rudder sail mount, your options for this kayak are nearly endless. Equipped with rod holders and paddle holders you can free your hands for an even longer day out on the water. Easy to carry handles make portaging and transporting this boat a breeze. This kayak is propelled through the water with a pedal system. You can pedal one way to move forward, and pedal in the opposite direction to go backward. There are also rod holders for hands-free fishing, and the rod holders can also double as cup holders. You can remove the seat if you wish, and also reposition it in a variety of places. 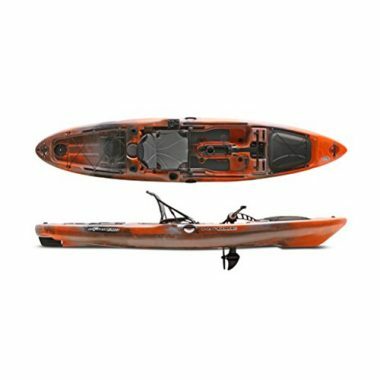 The Perception Kayak Pescador Pro 12.0 also offers great storage options for all your kayaking gear. The paddle holders also allow you to quickly grab your rod without having to worry about your paddles falling into the water. 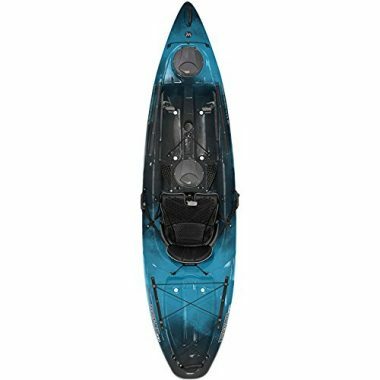 Fly fishing kayak reviews agree that the most important things to look for in your boat is one equipped with rod holders, and one sturdy enough to be able to sit in a number of different positions. Fishing in a kayak can be challenging, but the right shape and size will go a long way to improve your time. Getting the right deck will also make your fishing experience vastly more enjoyable. This is a very important question to ask during your search. A river kayak will look vastly different than a lake kayak. For fast moving water scenarios a more covered deck could be a better option. This will keep you dry during your travels and allow you to keep warm and comfortable. If the water is slow and calm a sit on top option will suit you better. This will let more water crest the bow, but allows you to move around and even stand to fish. If you predominantly fish in rivers you should look for a boat that is more stable and shorter. This will provide you with the balance you need to maneuver around in the fast current with confidence. Since you will be paddling a medium distance a short to medium length will give you the speed and efficiency your arms will appreciate. A wide, open cockpit will be the best option for fishing, especially fly fishing. You need lots of room for the line to dangle which a small opening won’t allow. This will also make it easy to haul your catch in and store it. Especially sit on top options have enough room to even bring a medium sized cooler for your trip. The stability of your kayak is very important normally, but even more so when you are fishing. You are going to be moving around a lot in your kayak, so you need the kayak to excellent stability in the water. You are also going to be in moving water, so there is more chance of the kayak moving. Combine that with the motion of casting your rod, and it is easy to see that you need more stability than a recreational kayak. Look for a kayak which is wide. The width will stop the kayak from rocking as much when you are in the water. Look for a kayak which is close to 30” in width. You should also be thinking about the length of your kayak. The more presence in the water, the more stability. A longer kayak will also give you the chance to more evenly distribute your gear. When you are fly fishing, you need to be able to stand up at times. If you are the kind of fisher who stands up regularly, then you are going to want to look for a kayak which is wider than normal. Look for a kayak which is at least 33 inches in width. If you want even more stability, then you can invest in standing platforms and stand-in bars. These accessories will allow you to stand up quicker and easier without rocking the boat. If you are out on the water fishing, you are not there for a short period of time. Fishing requires patience, and the fish do not bite straight away. You may be waiting a long time to catch a fish, but that is part of what fishing is all about. You are out there to find peace and calm, and if you can get a couple of fish, then all the better. 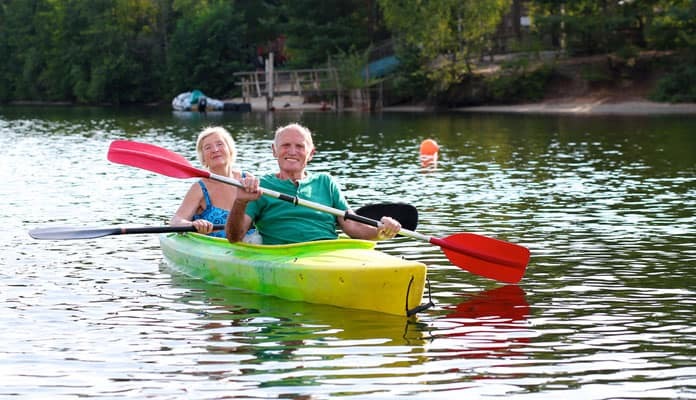 Look for a kayak which has enough comfort to keep you out on the water for a long time. You should be primarily focused on your seat. A padded seat will support you, and a backrest will help to keep your spine aligned. You should also try and find a seat which is adjustable so that you can find the perfect sitting position. A seat with breathable mesh will also help to keep you cool and to wick any moisture away from you when you are seated. When you are fishing, you want a lot of space to store your fishing equipment, and any other accessories you have on your trip. You should also be thinking about the weight capacity of your kayak. It is ideal if there is a place where you can process your fish, and store them until you get back to the shore. You will likely have hooks, bait, and flies. You want to be able to store a lot of each item, so storage with lots of compartments to organize your stuff would be beneficial. You also want to keep your stuff dry, so look for storage which is waterproof. With the amount of fishing you will be doing, you want to be able to take as much with you as you can. When you are looking at your fishing kayak, look for one which can carry a lot of weight. This will allow you to bring any number of tackle boxes, and still have enough room and capacity for your food. If you are fly fishing, then a sit on top kayak is the perfect vessel for you to wish from. These kayaks have no cockpit to sit in. Instead, you sit on the top of the kayak, usually in a seat. This comes with a few benefits. One of the benefits is that there is more space for storage. Instead of your legs being store over a lot of the kayak, you can use this space for your fishing equipment. The other benefit of this kind of deck kayak is that it is easier for you to stand in your kayak. With this added benefit, you want to make sure that you are always safe, so when you are looking at a kayak with a deck, you should be focused on the traction which the pad will give you. The size of your kayak will depend on how much you want to take with you on your trip. The more you want to take, the bigger a kayak you will need. The same is true if you want to take another person with you. The shape will also depend on the kind of fishing you are going to do. Some shapes of kayak will give you greater maneuverability, while others will others will give you more speed. Q: Can A Fish Pull You Out Of Your Kayak? A: Yes, a fish can pull you out of your kayak, but only if you are not careful and your kayak is not set up correctly. The first thing you should be doing is to have you kayak balanced carefully. 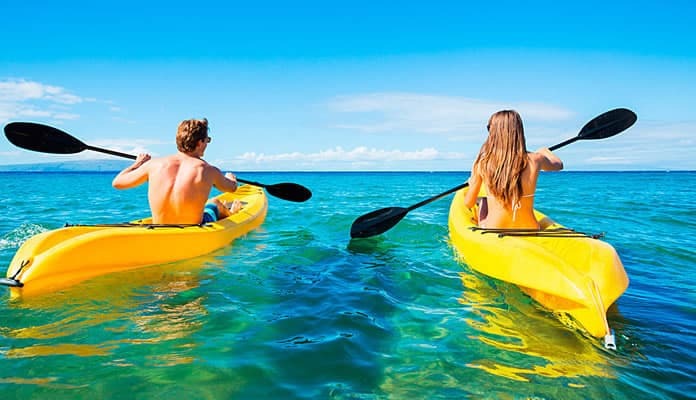 If you have the weight distributed evenly, then you do not have to worry about losing your balance if you need to stand up, as the kayak will not rock to one side. Make sure that you have your drag set properly. Always follow the instruction guide to set your drag properly, and do the same with an anchor. If you are catching large fish, and are worried about being pulled out of your kayak, then you are probably in the ocean. Make sure that you have an anchor which can cope with the currents of the water. If you have everything set up properly, then you will be able to catch large fish with no worry about ever falling out of your boat. Q: Where Do You Put The Fish Which You Catch? A: There are two options for your fish storage, and they will depend on the set up of your kayak. The main option is to use a cooler. You can buy special coolers to be used for fish, but a regular cooler will also work if you pack it with enough ice, or have it cold enough for the fish. Your second option is to use an insulated bag on your deck. The insulated bag will sit in front of you, so may be easier to get in without having to stand up. You should also be looking for a space to process your fish on the kayak. Q: Can I Put a Motor On My Fishing Kayak? A: If you kayak comes with space for a motor mount, then you can place a motor on there, as long as you find a motor which is compatible with your kayak. You want to make sure that your kayak can take the force of the motor which attached. If you do not have space for a motor mount, then there are still ways to attach a motor, but we would not recommend it, as you can damage your kayak in the process. Kayaking is an old sport that is forever expanding to take people even further away from shore. From using these small boats to take you on a multi night trip or whether you prefer to spend your days fishing, it offers something for everyone. While fishing has long ago been popular with kayakers, with a modern and stable design more and more people are turning to kayaks for fly fishing as well. This is because you are able to stand up and cast your line. River kayak reviews agree that taking the sport of fly fishing and practicing with the help of a kayak will take you even farther. Being able to navigate through narrow rivers and stand up in your boat will provide all the comfort of a big fishing boat with the convenience of a kayak. Have you ever tried fly fishing with your kayak? Ever used a kayak on our list? Let us know how you like it in the comment section below.